yourFXguide- Candlesticks chart patterns are very simple to identify and very effective to trade. 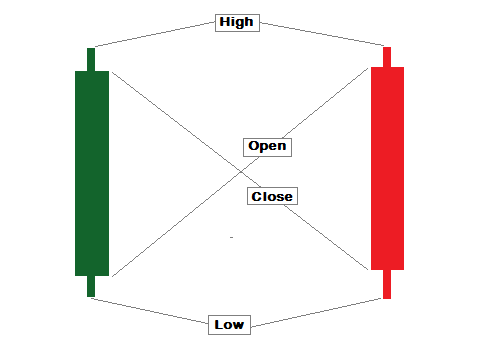 Generally, we find two kinds of candlestick patterns on price chart simple and complex. We can define the two kinds of candlestick pattern without any complexity. A simple candlestick pattern composed of only one candle, and a complex candlestick pattern is composed of more than one candles. 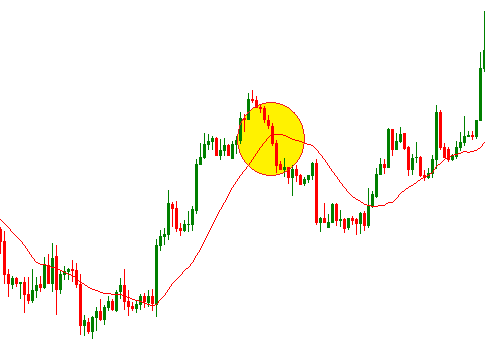 In this post we are going to learn about big candle candlestick pattern. The big candle candlestick pattern has a large difference between opening and closing price.The shadows of the candle are relatively small, shadow is the part of the candle beyond the opening and closing price. The big candle candlestick pattern has two types green and red, they are also called as bullish and bearish respectively. However, you can see how the bullish and bearish big candles look like in the above illustration. Let's see how they act on the practical market chart. A big candle (green or red) is not alone sufficient to find entry or exit signal on candlestick charts, they have to be appeared at a support level, at the time of indicators' signals or after another important chart pattern formation or breakout. Following practical examples will make this point clear. In the above price chart we can see a big green candle is formed after a doji. 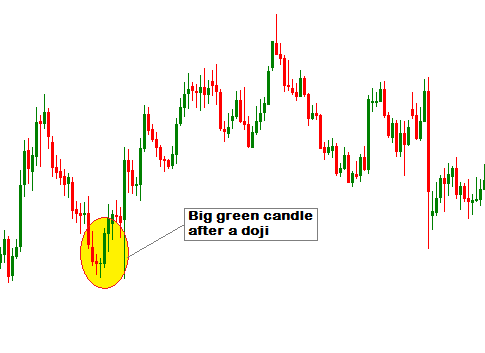 Doji is another simple candlestick chart pattern that can signal reversals of bullish or bearish trend. A very simple and easy to interpret trading system is trading the breakouts of 20 period moving average. This trading system is very popular among the day traders and other short term traders. In the above image we can see a big red candle appears when the breakout of a 20 period moving average takes place. Whenever a big candle appears during or just after the breakout of a moving average or any support or resistance level the breakout is considered to be reliable. There was a time when traders had less knowledge about technical indicators. Thanks to the internet that introduced hundreds of indicators to millions of traders. 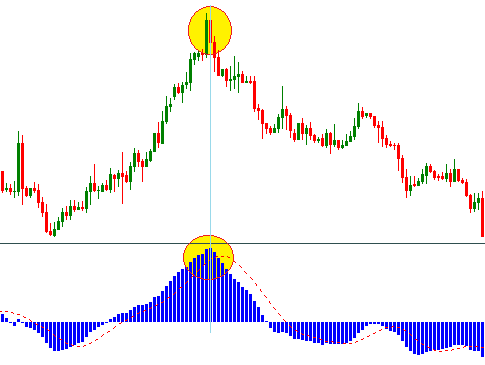 MACD histograms is a very crucial indicator in technical trading. We can see in the above price chart a big green candle appears when the MACD histograms make a peak. Most of the traders who spent couple of months in financial market, surfed the internet and made hundreds of search on google, came to know the trading strategy with pivot point analysis. We know two popular pivot point trading strategies are range and breakout trading. 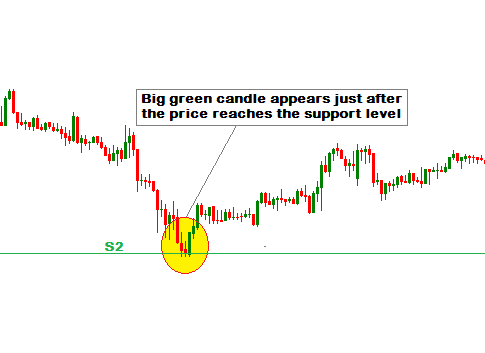 How breakout traders can be benefited with big candle candlestick chart pattern is explained in the middle of this post in the example of moving average breakout.In the above illustration we showed how range traders can use big candles to be more confident in trading. We can see price kissed the support level and then made a big green candle. The very important thing about big candle candlestick pattern is that a big green candle basically indicates a bullish trend and a red candle indicates a bearish trend. But they never be considered as a reliable signal providers rather they are considered as a tool of measuring reliability of the signals provided by other technical analysis tools.